SYNOPSIS OF ARTICLE: The Harmony Triads give each of us: (1) a type that leads with a different one of the three centers of intelligence – head, heart, and body, (2) a type that leads with a different one of the three great life energies – active, receptive, and balancing, and (3) a type that leads with a different one of the three basic forms of emotional regulation and conflict resolution – refraining into positives, containing through logical analysis, and expressing deep concerns to get to the root of conflict. Thus the harmony triads provide all that is necessary for a satisfactory life and the understanding of self and others. This article is the first comprehensive paper that deals with and explores all three of these vital functions in depth. What do I mean by the Harmony Triads being a key to development and integration? What is integration and what is its relationship to transformation? How might these triads provide keys to much of what is needed for our work of development? I start with the questions of how can we provide the Epicure Seven with a Heart Center connection and the Giver Two a Head Center connection? The lines of connection in the process Enneagram view of the Enneagram simply don’t do this. Moreover, types Four and Five are only connected through being each other’s wing type. Yet we all know that we have some of all three centers of intelligence. When we draw the line between types Four and Seven we have a new equilateral triangle of Types 1-4-7 and our Epicure Sevens now has a Heart Center. Similarly, when we draw the line between Types Two and Five, our Giver Twos now have a Head Center. 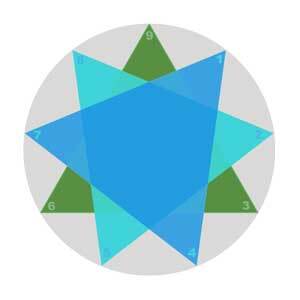 We now have three equilateral triangles each of which have all three centers of intelligence represented – types 3-6-9, 1-4-7, and 2-5-8. These can be named the Harmony Triads (Figure 1 below). These triangles also result from ancient astronomical observation of the planet cycles of Jupiter and Saturn over time. Over the years I have found that every Two has a “secret” connection to type Five where they pull back, restore, conserve energy, and reflect mentally. And Fives can be giving with heartfelt generosity. They just want to know for how long, essentially that there is a beginning, middle and end to the claims being made upon them. Also I have seen many Sevens confused because they have times of strong feelings especially as they awaken and allow in a range of feelings that include the “darker” feelings. Likewise Fours have times of the incredible lightness of being especially as they awaken and focus more upon the positives that have always been there. Furthermore, the Harmony Triads provide a natural flow among the three centers of intelligence once attention is put on these equilateral triangles. Those of us in the basic triad of types 3-6-9 know that there is much movement among the types in the triad with each of the types becoming a resource. Flow can occur in any direction depending upon the requirements of any particular situation once we awaken to this natural process. When those in the other two equilateral triangles become aware, they too can experience this natural flow of movement which allows for an increase of free energy. This may, in fact, be the most important facet provided by the Harmony Triads. The Harmony triads also present three ways of relating in the world. Types 3-6-9 can be called the Pragmatists as they relate to how we blend into and thrive in the world. Don Riso and Russ Hudson call these types the Attachment triad as they tell how we connect on a down-to-earth basis in our daily lives. Bill Schafer even names these the Earth triad as these types govern our basic existence and hands-on attachments in the world. Thus Threes seek a practical and sustaining role in the world. Sixes seek to assure a safe and secure existence in the world. And Nines seek a comfortable position or place in the world. Threes have “lost” or gone away from the higher quality of hope, of knowing that being can manifest in the material day-to-day world. Sixes have “lost” or gone away from the higher quality of faith knowing that the quality of pure being can manifest in the practical day-to-day world. And Nines have “lost” or gone away from the higher quality of true love, of love of self which is equal to love of all others. The path for those of us with these types is to release from clinging to reassuring worldly attachments, allow in discomfort, and ultimate integrate in the higher qualities into the day-to-day material world in which we all live. Types 2-5-8 can be called the Relationists as they are core exemplars of the three great moves in all relationships: toward others to meet needs and care take (type Two), away from others to deliver reason and perspective (type Five), and declarative with others, meaning to speak out and assert what is required (type Eight). Don Riso and Russ Hudson name these types the Rejection triad as they stave off rejection through providing necessary functions with Twos offering care and support, Fives thoughtful analysis and rational viewpoints, and Eights strength and protection. They all assert power through these vital functions. Bill Schafer names these the Human triad as they speak from the heart and the bonds of connection. These three types also have “lost” or gone away from the integration of their higher qualities into personality function in daily life. Twos have “lost” or gone away from manifesting altruistic love and care and being in the natural flow of giving and receiving. Fives have “lost” or gone away from manifesting higher wisdom and understanding and being in the natural flow of life energy. And Eights have “lost” or gone away from manifesting a fresh innocent perspective and being in natural assertive action without a personal agenda. The path for those of us leading with these types is to release from the deep concerns about rejection and to open the heart to the natural flow of love and life energy. Types 1-4-7 can be called the Idealists as they each hold a vision of the way the world could be in order for life and spirit to thrive. Don Riso and Russ Hudson call these types the Frustration triad as they tell us how life fails to reach the idealized view. The world just doesn’t match the ideal. Bill Schafer names these the Heaven triad as they speak to the possibilities of the ultimate integration of personality and spirit. Thus Ones seek the perfect world according to the internal standards of the way things ought to be and are frustrated that this doesn’t happen. Fours seek the ultimate ideal world in which nothing of importance or substance is missing and are frustrated and disappointed that this rarely happens. And Sevens seek the ideal positive world free of suffering and pain by going to something new and positive when frustration occurs. Ones have “lost” or gone away from the appreciation of difference in life and the experience of the each being as an authentic expression of the whole range of divine expression. Fours have “lost” or gone away from the appreciation of the wholeness in all there is by focusing on what isn’t or is missing. And Sevens have “lost” or gone away from embracing all of live in each moment and the accompanying wholeness of being. The path for those of us leading with these types is to release from frustration and embrace the entire spectrum of live in each moment. Types Leading with the Head Center: Types 5, 6, and 7 tend to filter the world through the mental faculties. The goals of this center are to help us all minimize anxiety, manage potentially painful situations and gain a sense of certainty and security through our mental processes of analyzing, figuring out, envisioning, imagining and planning. In addition, all of us depend upon the Head Center intelligence to develop the higher qualities of wisdom, inner knowing and thoughtfulness. Importantly, we all experience the basic aversive emotion of fear/anxiety found in all mammals that we don’t want to feel when we experience threat and insecurity which motivates us to attain the basic need security and safety. Ironically this motivation can also inhibit or development as we need to question their validity in order to grow.Key Words: Security, Safety, Certainty, Assurance, Predictability, and Opportunity. Key Words: Security, Safety, Certainty, Assurance, Predictability, and Opportunity. Types Leading with the Heart Center: Types 2, 3, and 4 tend to perceive the world through the filter of relational intelligence that covers the range of emotions. The heart center tunes us to the mood and feeling state in others and ourselves so that we can meet the vital needs for connection, contact, and approval. We also get recognition from others which helps us support our self-esteem and fulfill our need for love and connection. To assure that we receive approval and recognition, we embody an image of ourselves at a very deep and relatively non-conscious level that gets others to accept and love us. Moreover, every type depends on relational intelligence to develop the higher qualities of the Heart Center – empathy, understanding, compassion, and loving-kindness. When we have the threat or loss of connection, we experience the basic aversive emotion of distress/sadness found in all mammals, but especially powerful in humans because of our long years of dependency. This motivates us to stay connected or do something to reconnect in order to get and sustain love and vital bonds with others. Again ironically avoidance of these feelings can inhibit or questioning their validity and hence our growth and development. Types Leading with the Body Center: Types 8, 9, and 1 tend to filter the world through an intelligence of kinesthetic or physical sensations and gut instincts which serves to empower us in our pursuit of needs of all sorts and assure our well-being in all sorts of ways, e.g., physical and emotional. Yet we all use personal position and power to make life be the way we believe it “should be.” We devise strategies to assure our place in the world and minimize discomfort. All types depend upon the Body Center of intelligence to be in touch with its higher qualities – the right amount of energy needed for action, how much power to use in pursuing our needs and psychological-spiritual integrity, and being grounded in ourselves and in the world. We all experience the basic aversive emotion of anger/rage found in all mammals that we don’t want to feel when our basic need for self-worth, position in the world, and getting what we want are threatened. In turn, this then drives our behavior for better and worse. Here also avoidance of these feelings can restrict confronting them and determining their validity and relevance in our lives, thus restricting our development. But there is more to what the Harmony triads provide. Each triad also provides a type that leads with one of the aspects of the great life energy – the active, receptive, and balancing facets. These three manifestations of Qi or the flow of life force (energy) too are embedded in the Harmony Triad structure (see Figure 2 below). Active or yang energy, the lead aspect of types 3-7-8, flows outward into assertive and decisive action that is unrestricted and expanding. These are the types that most readily reach out and make things happen in the world. It even can manifest as alert stillness. This energy is over valued in modern achievement and success oriented cultures. When contracted this aspect gets expressed outwardly as unrestrained, not unrestricted, action and aggression. For Threes this manifests as a goal focused fast pace that excludes feelings, for Sevens as insisting on their view of options and opportunities, and for Eights as an all or nothing approach to life, an imposing of their will on others. In the Don Riso and Russ Hudson view of what they name the Hornevian triads, these are called the Assertive types. Receptive or yin energy, the lead aspect of types 4-5-9, flows inward as openness and receptivity and outwardly as flexibility of action. It too can show up as stillness, a readiness for action. This aspect of vital energy is under-developed in our busy modern world leading to endless preoccupation with expansion and acquisition. This is the form of vital energy manifested as openhearted grounded presence which allows us to witness others and ourselves with empathy and understanding and to receive and integrate in that for which we are grateful. Receptive energy also manifests as we move up the levels of development through self-observation practice (also based on grounded presence and open heartedness) and through working with our type structure. When fully developed it becomes the great emulsifier which allows our essential or higher qualities to be integrated into our personality. When contracted, this aspect leads to inertia and withdrawal. For Fours this manifests as inward preoccupation with feelings and self-referencing, for Fives as contraction away from feelings and others’ impact, and for Nines as a stubborn digging in and numbing out. These get called the Withdrawing types in the Hornevian approach of Don Riso and Russ Hudson. Balancing or yin/yang energy, the lead aspect of types 1-2-6, represents a reconciling energy harmonizing both active and receptive aspects. It manifests as a continuous adjustments that we make to the ever-changing circumstances where in reaction occurs if either receptive or active energy seems to dominate. This balancing function reminds me of a teeter-totter that we as children played upon where there was just no fun if we couldn’t create movement, flow, and balance. This balancing aspect of energy allows us to thrive efficiently and effectively. When contracted this energy collapses into a narrow and amplified rigidity, a teeter-totter stuck in not moving. For Ones this manifests as the one right way, for Twos as knowing best what others need, and for Sixes rigidity about harm and danger. Don Riso and Russ Hudson call these types Compliant or Dutiful types in their Hornevian approach. To me, these three vital aspects of life energy, when in flowing balance and applied appropriately for any given situation, allow us to flourish. 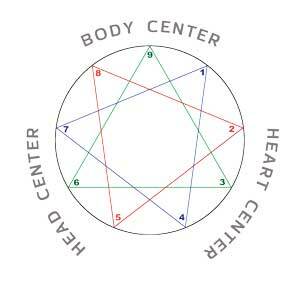 The Harmony Triad approach to the Enneagram gives each triad all three of these manifestations of life energy. There is one exception here. An alternate and equally valid view is that while Type 3 provides the active/affirming aspect of energy and Type 6 the balancing aspect — when either receptive or active energy get too dominate Type 9 because of its other-referencing quality with the ability to see all points of view and desire to create harmony may also represent balancing energy, not only receptive energy. Thus, the receptive force type of Type 9 also has a balancing function. In unity, Type 9 even represents the one energy with two aspects, assertive and receptive, and how they get balanced. Sustaining and Expressing represents the primary form of emotional regulation in types 4-6-8 which means they tend to over use this strategy in order to obtain the three basic needs. These types cope by voicing their concerns, feelings, and positions; by intensifying and amplifying their positions in order to be understood and get what they believe is important; and by voicing their views about what is needed to resolve conflict. Difficulty arises from not hearing other points of view and in amplifying conflict situations. For Don Riso and Russ Hudson’s Harmonic triad approach, these are the Reactive types meaning they react emotionally to conflicts and problems. Containing and Rational represents the primary form of emotional regulation in types 1-3-5 which here means they tend to over use this strategy in order to gain the three basic needs. These types cope by becoming rational and analytic, subduing and suppressing feelings, distancing from emotion in order to stay “objective”, finding intellectual solutions and reasonable action steps, and by striving to solve conflict logically and reasonably. The difficulty arises from not addressing the depth and meaning of feelings and even in discounting these. In their Harmonic triad approach, Don Riso and Russ Hudson name these types the Competency group meaning they strive to be objective, effective, and competent as a way to deal with conflicts and by putting aside personal feelings. Reframing and Shifting represents the primary form of emotional regulation in types 2-7-9 which again means they tend to over use this strategy in pursuit of the three basic needs. These types cope with conflict by shifting away from it, going to positives, reframing the situation, seeing the bright side of things, looking for ameliorating and better alternatives, and by restructuring the situation. The difficulty can be in avoiding necessary confrontation and exploration of the issues at hand. These are named the Positive Outlook types by Don Riso and Russ Hudson in their Harmonic triad way, meaning adopting an optimistic attitude toward conflict and reframing problems into positive alternatives. This remarkable unearthing of all three intelligences, the dynamic flow among the three intelligences, all three facets of life energy/force, and all three forms of emotional regulation intrinsic to the Harmony Triads, yet hidden from us until revealed, requires the work of integration in order to bring all these vital functions into balance and into healthy, joyful usage. Integration means the interlinking and balancing of differentiated parts. To me balancing all the functions imbedded in the Harmony triads is fundamental to the process of transformation, of reclaiming our higher essential qualities since balance gives us much free energy that allows us to release into and integrate in our higher essential qualities. To attain integration requires applying the “5As” of the Universal Growth Process. We need to develop grounded and receptive presence (the 1st A of Awareness) and open-hearted, non-judgmentalness (the 2nd A of Acceptance). In this way, we can witness, with the inner observer, our behaviors and imbalances with kindness. We need to be grateful for the value given us in all the elements contained in the Harmony triads (the 3rd A of Appreciation). Then we need to do the actual work of integration by pausing, noticing, inquiring, and reflecting on how these elements inherent in the Harmony Triads are out of balance or misapplied, resulting in upset and reactivity, and how we might best bring these elements into balance and assure their harmonious usage (the 4th A of Action). 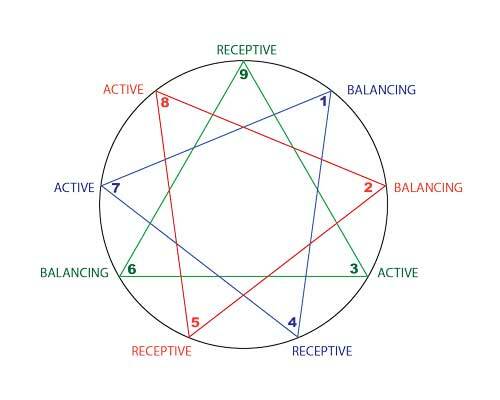 Here our Enneagram type comes in as it influences the way we approach and resolve conflict, what energy we most over use and under use, and how our centers of intelligence are out of balance. As cited above this work even is a path to reclaiming our higher spiritual or essential qualities as we bring all the Harmony Triad functions into balance which allows us to integrate these qualities into our daily lives. And, yes, lastly all this requires commitment and takes daily practice (the 5th A of Adherence). When we see and deeply appreciate the multiple functions of these, our Harmony Triads, we can bring them into our relationships which helps us open the door to more compassion for ourselves and others and helps us to manifest more and wiser options for dealing with the reactivity that naturally happens in our lives. It is my hope that we all can embrace this work of integrating all the functions the Harmony Triads give us (see Figure 4 below). 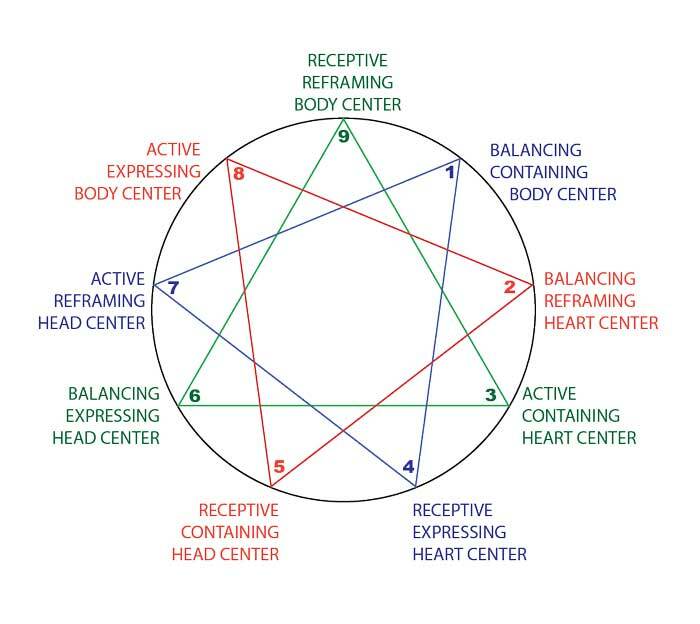 Toward the Neurobiology of the Enneagram by Jack Killen. TALK, Journal of the AET, 2008 & The Enneagram Journal, Volume 2, 2009). 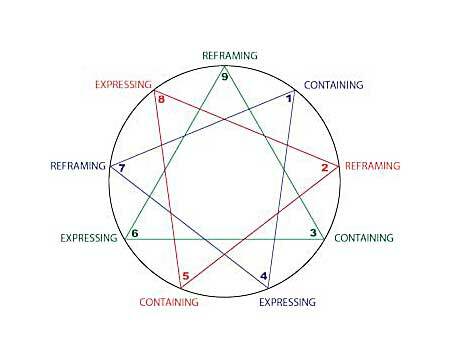 Roaming Free Inside the Cage: A Daoist Approach to the Enneagram and Spiritual Transformation by Schafer, W. iUniverse, 2009, Bloomington, Indiana. Hidden in Plain Sight: Observations on the Origins of the Enneagram by Virginia Wiltse and Helen Palmer. IEA Journal, Volume 4, 2011. Mindsight: The New Science of Personal Transformation by Daniel Siegel. (Bantam Books, 2010. Affective Neuroscience: The Foundations of Human and Animal Emotions by Jaak Panksepp. Oxford University Press, 1998. New York, NY. Handbook of Emotion Regulation by James Gross and Ross Thompson, eds. Guilford Press, 2007. New York, NY. The Developing Mind: How Relationships and the Brain Interact to Shape Who We Are, by Daniel J. Siegel. The Guilford Press, 1999. New York, NY. Considerable material on the three forms of Emotional Regulation and the three basic aversive emotions comes from the work of Dr. Jack Killen; considerable of the three energy referencing comes from the work of Dr. Bill Schafer and Helen Palmer.